WASHINGTON (CNN) -- When the waiter reached for the plate, President Obama shook his head and smiled as he asked for a few more minutes. He had been talking to his guests, and had barely taken a bite of his lunch. Obama's team believes stimulus speed is critical but knows there's a danger in trying too much, too fast. The new president was keeping with a longstanding tradition on days when the commander in chief delivers an address to a joint session of Congress: Around the table Tuesday sat television anchors and the Sunday morning interview program hosts and two senior aides. The location was the dining room in the White House residence. Over lunch of lobster bisque and striped bass, it was a chance for the president to share his thoughts on the goals of Tuesday night's big speech and the challenges ahead. There were ground rules for the discussion: We are not allowed to quote the president or his senior aides directly. In Washington journalism parlance, this is called "background" -- what we heard was attributable to "senior administration officials." Or, the ground rules allow such constructions as, "The president is known to believe ..." or "The way the White House sees this is ..."
• In describing the economy, the overwhelming focus of the speech, Obama's goals include helping the American people better understand the connection between different ailing sectors; the crisis in financial institutions, for example, to the reluctance of small businesses to hire new workers because, perhaps, the credit crunch is limiting their ability to expand. • The president is mindful of the criticism he has been too negative in talking about the economy. But he believes being realistic is the best way to keep credibility with the American people. Look for a description of the economy as a sick patient who needs a lot of urgent care yet has a good long-term prognosis. iReport.com: What did you think of Obama's speech? • The White House team, from the top down, believed speed was critical to getting stimulus funds into the economy. The price they knew they would pay, however, is that without any significant Republican support, the debate played straight into the enduring divide between Democrats and Republicans over spending and the role of government. • Obama exudes confidence. But he and his team are clearly mindful that there is a danger, from both a policy and a political perspective, in trying do to so much so fast. One of the officials acknowledged there are many credible voices who take issue with the administration's approach, and noted in dealing with the stress on the financial system and other early decisions, Obama was making a series of "judgment calls" mindful of the fact that any time one acts so quickly it is inevitable some mistakes will be made. The president's take is that if 98 percent of a program is a success, and the need was urgent, then the 2 percent that goes awry is an acceptable tradeoff. • He believes it is realistic, based on current economic projections, to pledge to cut the record annual federal budget deficit in half by the end of his first term. The White House budget out this week, Obama's first, will project that some of that deficit reduction will come through slicing the costs of the Iraq war by bringing troops home and by increased revenue as a result of allowing the Bush tax cuts for Americans making more than $250,000 a year to expire. But the White House also promises to take the knife to some Democratic "sacred cows" as it searches for spending cuts. • Look for education as a potential issue on which Obama will reach out for bipartisanship that was missing from the stimulus debate. The president sees an opening on issues like bonuses for exceptional teachers to work with Republicans. 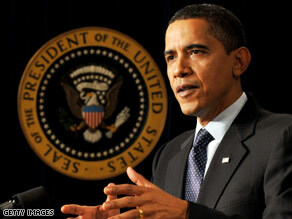 • The first movie Obama viewed in the White House theater was "Slumdog Millionaire." He loved it, and parts of the movie reminded him of his childhood days in Jakarta, Indonesia. • He enjoys the "baubles" that come with the presidency -- Air Force One, Marine One and Camp David, for example. But he already finds the "bubble" too restricting and wishes it was easier to just take a walk, or attend his daughters' school and sporting events. One way of trying to better stay in touch with everyday Americans: Obama has instructed his staff to bring him 10 letters a week from citizens writing with a complaint or an observation. • He cherishes family dinner in the White House, where "thorns and roses" is now the favorite family game. Each family member describes the day's highlight, or rose, and the day's worst moment, the thorn. We were told after describing one particularly challenging day at the White House, Malia Obama had this to say to her father the president: "You have a really thorny job."